The negative outcome of a project activity. The likelihood that the outcome will occur. For example, a project manager might think that printing a final project report contains the risk that the power will go out prior to printing. But because a power failure is unlikely, the risk can be safely ignored. A more reasonable risk to plan for might be the unavailability of a print shop for a more complex, high-quality shareholder report. For this risk, the project manager should schedule more time for report printing. Here are some typical activities and events that can increase risk in a project. Pay close attention to tasks that are on the critical path. They have more risk because they have the greatest impact on the end date of the project. When you contract with a vendor, request more frequent or detailed progress reports than you would with your own team members. Vendor tasks that occur at the end of a project have more risk than vendor tasks at other times. Vendors include both contracted people outside your company as well as employees from other areas of your company. Because both are further out of your control than people on your own team, both should be treated the same in terms of risk to a project outcome. Assigning inexperienced workers assigned to work at the end of the project endangers the end date of the project because they might need more ramp-up time. Minimize this risk by scheduling sufficient ramp-up time for new workers. Projects that take longer than a year have more unknowns and thus contain more risk resulting from resource availability, technology changes, market changes, and so on. Check for an excessive number of tasks scheduled at the same time. Even if these tasks are being performed by different people, too many of them occurring at the same time creates risk in your project--especially toward the end of the project. Beginning project managers make the mistake of linking task before outlining them. This can lead to a confusion and lot of backtracking. When you start a new project, list and group tasks first so that you see the entire scope of the project and its deliverables. Then, you can start linking tasks to arrive at the ideal schedule. If you don’t make a record of project mistakes, you’re bound to repeat them in future projects. Projects often end with closing documents for the purpose of minimizing repeated risks to future projects. Here are tricks-of-the-trade project managers use to handle project risks. If a project activity results in serious consequences, avoidance is a good policy. For example, using a manufacturing processes at the same time for two deliverables can put project timing at. Instead, a project manager can avoid the risk by using the manufacturing process sequentially. Find ways to reduce the likelihood of a risk. For example, you might decide to use a simplified and well-understood manufacturing process if a more innovative and costly one will take too long to install. Control risk by transferring it to an external vendor. For example, if the documentation of a computer sub-system is too large in scope for internal resources to complete on time, contract portions of it to an external vendor. Not all risk is bad. Risk can also open the door to opportunity. For example, if after exploring risks in your project, you realize that a software sub-system being developed as part of a larger manufacturing process is itself marketable, you might decide to reassign your best engineers onto further developing the sub-system. Taking experienced engineers off a project creates additional risk in your project, but in this case it might be offset by the opportunity gained. If you want to track the progress of your schedule for the purpose of uncovering tasks that are a risk, you need to learn about setting baselines for your project. Review how efficiently your resources are being used in your project and whether you need to make any adjustments to overallocated or underallocated resources. View task updates from team members to learn where risks lie. 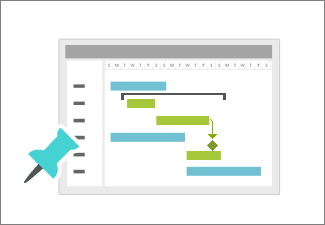 You can track progress quickly using the Gantt chart, or you can use a sophisticated earned-value analysis. Show tasks that have the greatest impact on the project end date. Look at these tasks first to spot risks in your schedule. The risks in a project can’t be seen by using just one view. Be comfortable exploring project risks by using a variety of views. Earned-value analysis helps you spot progress risks by asking questions like, “Looking at the amount of work done so far in this project, how much money were we supposed to have spent?” or "Will we finish on time?" When you manage a project for risk, you’re going to move around tasks in the schedule. Any change in a project comes at the expense of time, money, or scope. When you plan for risk and adjust your schedule, Project might move tasks around unexpectedly. Understand the big “Why?” behind Project’s powerful scheduling engine. After you enter project costs, examine them to be sure you haven’t created risks to your budget. Return to The project management road map.